Quick Collage – 250 FREE templates – Express & easy! Creating a quick photo collage these days is very simple. After all, not only is there a myriad of possibilities to create a photo collage online but there are also some very quick options too: Today’s software allows you to get creative at the click of a button. This saves a lot of time. But if you want to make a quick collage print, you don’t have to compromise on design. The collage templates at photo-collage.net are real time savers but offer a myriad of options. Tip: With “Arrange randomly”, you can automatically create your collage. Tip: JPEG files are best for uploading your photos. If you want to create a quick collage print as a gift, our easy online collage maker is ideal. 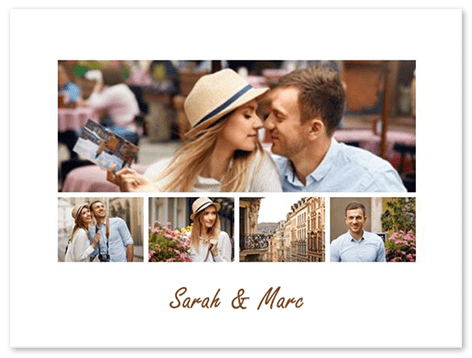 The quick collage maker allows you to create beautiful photo collages on a wide range of materials such as photo collage poster in numerous sizes in the blink of an eye. The perfect photo collage is just a few clicks away. But remember: If you want to give your collage as a gift, remember to take delivery times into consideration. Although it’s the thought that counts, if it’s not delivered in time, the surprise is ruined.